I’ve just finished building it and I’ve been using it for about an hour. No serious issues yet, other than the back and leg pain I had already from trudging around ikea, lifting and building the damn thing, etc. I’ll try to tweet about it so you can see the progress ( @kythin ). I originally was going to get one of the FREDERIK Ikea desks but they didn’t go up high enough to be comfortable for me, and I wanted something that looked fairly good too. Some big long chipboard screws from Bunnings (the biggest ones I could get). Some angle brackets and more chipboard screws (the biggest ones that would fit into the bracket). (The Bunnings stuff was roughly $15 all up, from memory). The desktop stands at 110 cm which is perfect for me. My forearms touch the desk when bent on the keyboard but don’t actually rest on it, which feels much more natural than my old desk. Comment if you want to know more, happy to take more pics etc if you want me to as well. This entry was posted in General, Projects and tagged featured by kythin. Bookmark the permalink. I’ve decided to build a desk like yours, and I’ve got a question. Based on the photos, the desk surface seems even with the surface of the bookcase’s top shelf. However, I can’t determine how long the legs need to be in order to do this, based solely on the information on the IKEA site. Were the 110cm shelves a perfect fit to make the desk level and even with the top shelf, or what? 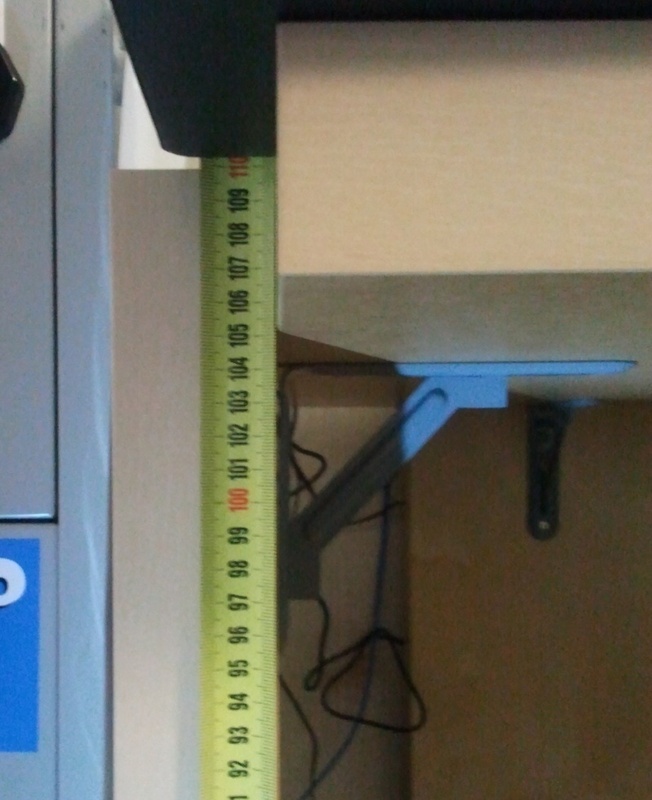 From memory the height from floor to the bottom of the desk is 105cm, and the shelves are 110cm. I’ve attached the shelves to the outside of the desk and used an L bracket on each with some chipboard screws to keep it there, and so far it’s stable and not going anywhere. I haven’t got a spirit level or anything, but if it isn’t level it would be pretty darn close! Hmm, well above you said that the desk stood at 110 cm, so either the 105 estimate is a bit small or the desk is about 2 inches thick. Is that the case? My visual guesstimate puts it at a little over 1 inch. Heya Rotaerk, yep you’re correct, it’s a pretty thick desk. I’ve added a photo (click it for the full thing) to the post with a measuring tape to hopefully help you out. The shelf is exactly 110cm and sits flush with the top of the desk, and the desk itself is 5cm thick. Good luck with your own project 🙂 I’d like to see how it goes!